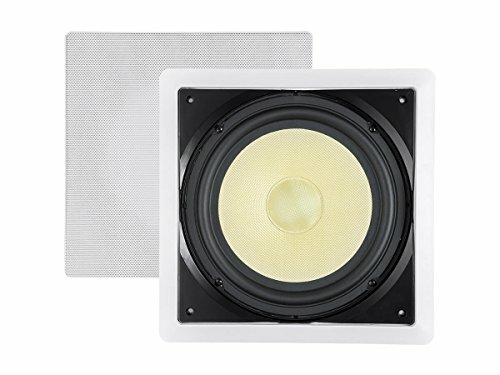 In-wall speakers are great for everyday listening. They're out of the way and don't take up floor space. This Caliber Series sub features an Aramid Fiber driver made from materials similar to what is used in DuPont™ Kevlar® fiber products. This extremely durable material is ideal for speaker drivers due to its ability to hold shape under heavy stress. The result is high volume bass extension with minimal distortion caused by irregular oscillations found in other polymer type drivers. Immerse yourself in full-bodied, room-filling bass. With a 300 watt peak power rating, you can run this sub with our Unity series 200-watt Bridgeable Power Amp. The 'Wife Acceptance Factor' is increased even more with our paintable grill and easy to use paint guard. The in-wall sub can blend into any home décor or environment. Easy Installation: The subwoofer includes easy-to-follow installation instructions. You can install it into almost any wall with at least 3.6" of space behind the wall. Aramid Fiber: The Aramid Fiber driver uses materials similar to what is used in DuPont™ Kevlar® fiber products. The sturdy construction holds its form better than polymers, which minimizes distortion. 300W Peak Power: The 300 watt peak power capacity means that you can fill your room with deep, earth-shattering bass. Paintable Grill: The paintable grill allows you to match the color of your walls to make the speaker virtually invisible. Aramid Fiber: The Aramid Fiber driver uses materials similar to what is used in DuPont Kevlar fiber products. The sturdy construction holds its form better than polymers, which minimizes distortion. Looks Good, Sounds Good: The combination of the low profile, in-wall design and the powerful subwoofer itself make for an excellent addition to a standard home theatre.